“We are presented with an opportunity of historic proportion - to upgrade our original vision of democracy to coincide with the way our country has grown and changed. It is an opportunity to make use of capabilities that simply didn’t exist when our country was founded, and to do this in the service of all citizens, above all else. We have an opportunity to renew our collective confidence in the power of our democracy, and to shepherd its transition from cynicism and helplessness to vibrant and enthusiastic civic engagement that will be a model for other democracies around the world." A very special and significant moment for humankind is upon us. Yet, it is a moment that most people have not yet recognized. For the first time in our known human history, it is now possible for an unlimited number of people to gather in one place, online, for the purpose of expressing our individual advisory votes and our collective advisory voice, on the very issues that affect us all. The very recent convergence of the Internet, social media and mobile devices makes this possible. Without changing or enacting a single law and without the need for a constitutional convention, a new national institution can be created and launched right now - one that operates “virtually,” right alongside the goings-on of government. It can provide our elected representative with ongoing advisory input from citizens, on a non-partisan, issue-by-issue basis, every single day. What are our collective values, intentions, desires, and priorities? Do we really want change? If so, what do we want it to look like? How high a national priority is addressing climate change? Do we believe that health care is a right or a privilege? How about guns – are there any limits to ownership that should be considered? What about military actions abroad? Where do we stand? How soon should we act? In what ways? What is it that we will and will not tolerate, at home and abroad? The answers to questions like these, define us as a country. Yet up until now, we have only been able to imagine what our real country looks like under the surface. By presenting important issues to citizens, one at a time, in self-contained advisory “Voting Modules” that include fact-verified educational material, different ways to vote, moderated discussions, and a way for popular voting issues to be disseminated effortlessly and securely, a new “issue-based” democracy will bypass the 2-party system and begin to filter for commonality. However, the creation of new, national infrastructure for civic engagement, is not something that can, or should, be left to chance. The same forces that have already corrupted our traditional democratic process will eventually understand the importance of the moment as well, and will likely attempt to shape the opportunity into one dedicated to quarterly profits, instead of one dedicated to empowering citizens. 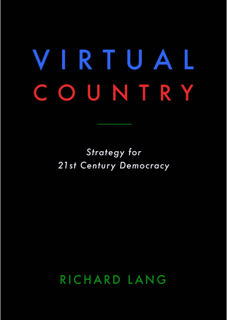 The Virtual Country strategy, completely non-partisan by design, is about collective self-examination and self-discovery, on a national and even international scale. It identifies an historic opportunity to update the software of our democracy in a way that re-invites “We the People” to take our rightful place at the table of self-governance, through the creation of a new, non-governmental, national institution for Advisory Voting. Successfully implemented, this strategy will transform politics as we know it, and will usher in a new era of civic engagement and collective achievement, of which our Founding Fathers could have only dreamed. The National Town Square: Coming Soon! and you'll receive an advance notification before the National Town Square goes "LIVE."